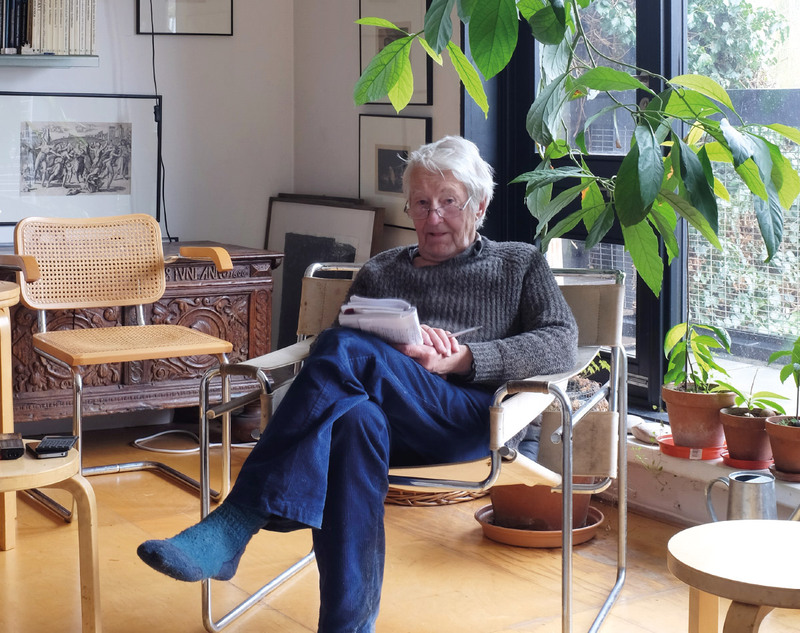 Two months before he died, in poor health and noticeably frail, architect Neave Brown packed East London’s Hackney Empire to capacity: 1,300 predominantly young architects came to hear from the man who had just been awarded the RIBA’s Royal Gold Medal. They gave him a standing ovation. Brown, who died on January 9, age 88, was the antithesis of the starchitect. He had completed his last building in the UK nearly 40 years earlier and a decade later finally put down his (pre-digital) drafting pens to become a painter. The medal came as a result of a reappraisal of his contribution to the architecture of housing and citymaking against the contemporary backdrop of a housing crisis, an expanding city, and the tragedy of the Grenfell Tower fire. Brown studied at London’s Architectural Association in the 1950s and was not alone in rejecting tower blocks as a model for the future, but few did more to develop an alternative model and do so with such a high level of architectural ambition and skill. His was a street-based architecture, low, ground-hugging, and dense, that owed as much to his admiration for the Georgian terraces of London as it did to a more apparent inspiration—Le Corbusier, for Brown had been both designer and cocurator of the retrospective of the Swiss architect’s work held at the Hayward gallery in 1987. In 1965, Brown completed a terrace of five houses at Winscombe Street in the London Borough of Camden. To meet the government’s demanding Parker Morris Committee space standards, Brown ingeniously created interior spaces that afforded both spaciousness and flexibility. Although thoroughly modern, the terrace fit the London street pattern, with clearly identifiable front doors a few steps up from the pavement and a shared garden behind. It encouraged sociability, a place where neighbors could and would drop by. It was here at Winscombe Street that Brown and his wife, Janet, brought up their children Victoria, Aaron, and Zoe, putting his ideas about the “intergenerational home” to the test. 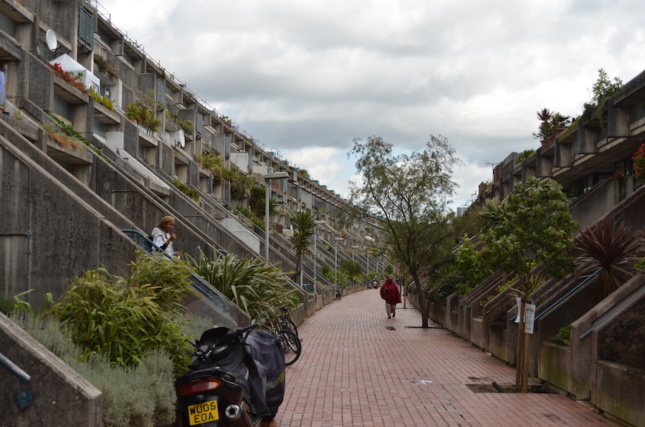 In the same year, Camden Borough Council appointed Sydney Cook as its chief architect committed to finding new models of low-rise high-density housing. Meeting Brown and visiting Winscombe Street convinced Cook that he had found the architect to design Camden’s future. Brown’s first project for Camden, Fleet Road, comprised 72 flats and a shop, with planted shared roof terraces and individual balconies and gardens. Built at the same density as a tower block, it rose from one to four stories. In later years Brown moved from Winscombe Street to Fleet Road, again becoming both resident architect and conscientious neighbor. Brown’s most famous project, Alexandra Road estate, was not so much a housing scheme as a microcosm of the modern city, incorporating a community center, two schools, shops, a youth club, and a maintenance depot, as well as 500 terraced homes along a gently curving street. Each flat has its front door to the street and a balcony facing south. The street and, parallel to it, a linear park contributed two new and distinctive public spaces to the city. Built at a time of rocketing inflation, the costs spiraled, and this, along with the uncompromising modernity of the design, caused controversy. The political changes brought by Margaret Thatcher effectively took housing out of the hands of local authorities and placed it with the national house builders. The future of London became, for a period, suburban in style and density. The experiment with low-rise high-density housing was stopped short, and Brown had to look beyond Britain for work. It was the public spaces of Alexandra Road and the integration of complex social facilities with housing that attracted the aldermen of The Hague to appoint Brown in 1987 to design a project of equivalent complexity and even higher density on the Zwolsestraat, marking the boundary of the city to the sand dunes and sea. Designed with David Porter, the project was at an advanced stage, with the building rising from the ground, when the developer-client determined to discard the intricate street-based public realm as designed and replace it with deck access. The architects relinquished the project. Brown was more successful with a delicate cluster of apartments built outside Bergamo in Italy and a second Dutch project, the Medina from 1993–2002, designed for central Eindhoven and aided by Jo Coenen, the state architect for Holland. In 2012, Brown was invited by the residents to join them to celebrate the tenth anniversary of the project’s completion. The architectural quality of Brown’s British projects was confirmed by their listing as historic monuments (Alexandra Road in 1993, Fleet Road in 2010, and Winscombe Street in 2014). As significant was Brown’s evident rapport with those that lived in the homes he designed. The listing of Alexandra Road as “Grade 2” (Buckingham palace is Grade 1) inspired the film, made in 2010 by residents about their experiences, entitled One Below the Queen. Alexandra Road was completed just as architects were becoming “postmodern.” Brown was not unhappy to be considered an ‘’old-fashioned modernist’’ remaining intellectually engaged with the formal language of architecture and its relevance to an inclusive society. The reappraisal of Brown’s work comes at a time when London’s population is rapidly growing, there is a housing shortage, and London’s skyline is under threat. We are again seeking new models for raising density but maintaining the scale of the city.